The Big Bang Theory is often about relationships, but tonight’s Season 8 finale was even more so than usual. The hit CBS comedy is mostly known for tickling our funny bones, but showrunner Steven Molaro and company put together a surprisingly emotional episode that ended on an incredibly sad moment for our hero Sheldon. It was a cliffhanger that will likely be worth the resolution when the show finally returns next fall. Here’s what happened. At the start of the episode Sheldon and Amy got into what started as a seemingly innocuous argument about the CW’s The Flash, a series that Sheldon feels will be on the air for sometime and can’t decide whether or not to watch. The issue of commitment is touched on however, and the two eventually come to an impasse about what is important, with Amy miffed that Sheldon could miss out on so many context clues. At first, Amy and Sheldon’s argument didn’t seem particularly important, as much of the a-plot was devoted to Penny and Leonard—finally—planning their wedding. They had a few surprising and lovely moments, too, in this near tearjerker of an episode. But more on that later. Unfortunately, as Sheldon moved forward during the episode, he didn’t seem to realize how worrying his actions were for his former gal pal and now-girlfriend Amy. At the end of the episode, she video chats with him, telling Sheldon she needs some time. Being your girlfriend is so challenging, emotionally, physically… This isn’t easy to say because I love you, but I need some time to take a step back and reevaluate our situation. I hope you understand. I know. Brutal. But that’s not even the tip of the iceberg. 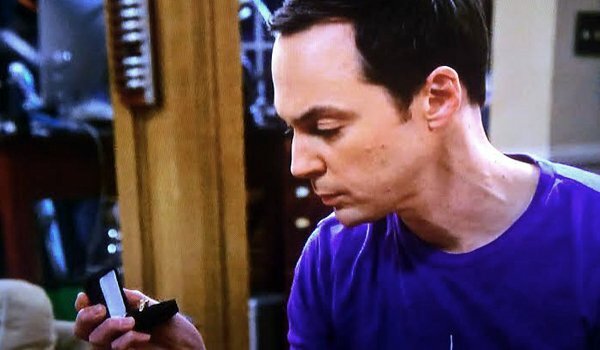 In the closing moments, Sheldon reveals that he has been keeping an engagement ring hidden in his desk drawer, waiting to ask Amy to marry him. In an moment that is about as emotional as Sheldon gets, he laments to the Golum figurine on his desk that he doesn’t know what to do with the ring now. Sheldon and Amy’s relationship has always been rocky, plagued by sexual frustrations and not being on the same page. Clearly, the situation wasn’t read correctly by Sheldon, but it’s hard not to feel bad for a guy who just wanted to pull a ring out of the drawer and tell the lady he often misunderstands, but does care deeply for, to marry him. The Big Bang Theory can be emotional at times, but there were far more “awws” thrown out during The Big Bang Theory’s Season 8 finale “The Commitment Determination” than I expected. Now, we’ll have to see how Sheldon picks up the pieces and moves forward—either with or without the woman he loves—in Season 9. To find out how The Big Bang Theory and other network TV shows are faring, head here.